The celebration of the 80th birthday of Markevych, a kobzar from Bilotserkva. Markevych is seated in the front, second from the right. 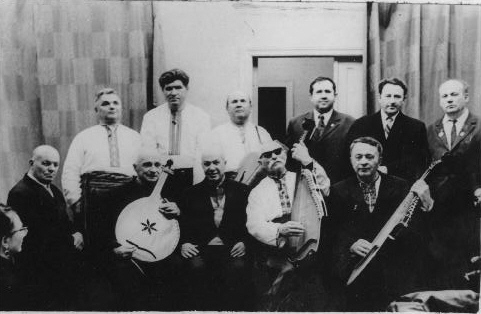 First person on the left is the scholar and performer Mykola Polotai; next to him is the Tkachenko, and architect, painter, and performer. In the middle is Fedir Lavrov who wrote a book about kobzari. Furthest to the right is Ovram Zharko. As scholars and other intellectuals became more and more involved with performers, they took up singing themselves. The first scholar-performer was Opanas Slastion. By the time of this photograph, sighted performers were no longer unusual.